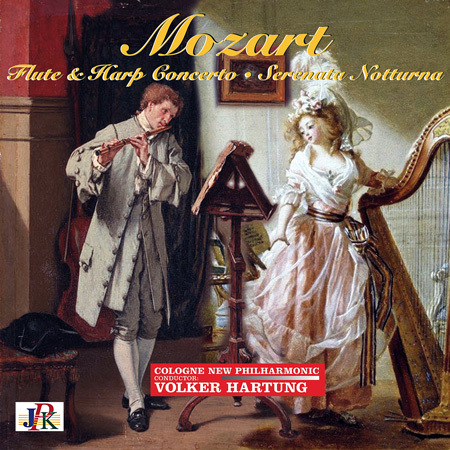 Listen to the Cologne New Philharmonic Orchestra conducted by Volker Hartung performing the Overture from Wolfgang Mozart's Opera 'Don Giovanni' - and his delightful double concerto for Flute, Harp and orchestra. Concluded by the wonderful serenade for string quartet, timpani and string orchestra 'Serenata Notturna', this album is a musical journey into the joyful and enlightened period of the Rokoko with its cultural splendor and grandeur. Maurice Ravel & Manuel de Falla - Nights in Gardens of Spain - New Album released! This Album celebrates the Magic of the Spanish South set to mesmerizing Music by Maurice Ravel, Georges Bizet and Manuel de Falla. De Falla' s wonderful impressions 'Nights in the Gardens of Spain' for piano and orchestra evoke the feelings of the composer when he visited the Arabian Palaces in Andalusia, in Granada and Cordoba. Italian pianist Filippo Faes gives a delightful and most sensitive performance. De Fallas ballet score 'El amor brujo (Love, the Magician)', sang by the great mezzo-soprano Dora Brockmann is distinctively Andalusian in character with the songs in the Andalusian Spanish dialect of the Gypsies. The music contains moments of remarkable beauty and originality. The Carmen Suites are two suites of orchestral music drawn from the music of Georges Bizet's 1875 famous opera 'Carmen'. This recording provides a selection of the best pieces from both suites. Bolero, is Ravel's most famous musical composition and was originally written as a ballet score, but is now usually played as a concert piece. The composition was a sensational success when it was premiered at the Paris Opéra in 1928 and has become world-famous since then. This album contains the slowest, yet powerful rendition of this work on record by Volker Hartung and his Cologne New Philharmonic Orchestra. 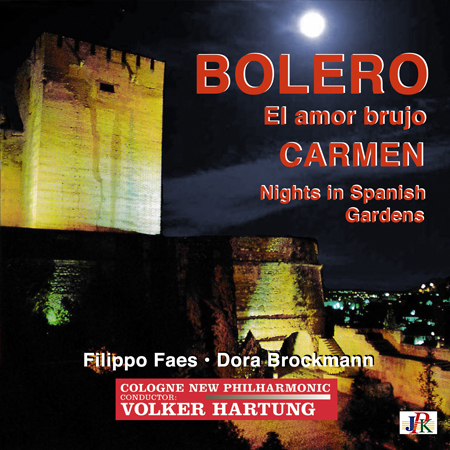 Maurice Ravel's Bolero, Georges Bizet's Carmen Suite, Manuel de Falla's Ballet 'El amor brujo' and his piano concerto 'Nights in the Gardens of Spain ' - these late romantic masterworks are presented here in a fabulous recording by Volker Hartung and his Cologne New Philharmonic Orchestra. Italian pianist Filippo Faes gives one of the greatest readings on record of de Falla's impressions of Andalusia. A great album not to be missed - remastered in 24bit/ 48khz and presented in fantastic sound.